Welcome to the Whitehern Museum Archives website. 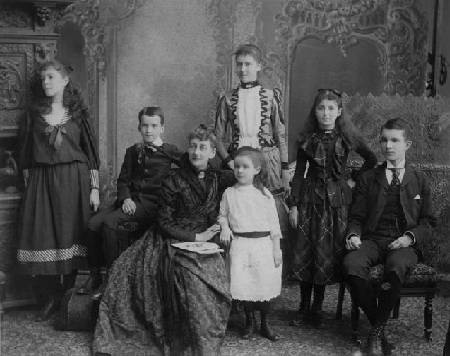 Within this site can be found a vast amount of information: 4000 letters, documents and photographs about one of Ontario's most outstanding Victorian families, the McQuestens of Whitehern in Hamilton, Ontario, Canada. The fascinating McQuesten history unfolds in a three-part saga: the Rise the Fall and the Restoration. Their history includes several distinguished members who were responsible for the development of industry in Hamilton, and for parks, highways, bridges, and landmarks throughout the Golden Horseshoe and Niagara and other parts of Ontario. Dr. Mary Anderson's second book, Tragedy & Triumph: Ruby & Thomas B. McQuesten (2011) was launched on April 9, 2011, at the Hamilton Public Library, on the 100th anniversary of Ruby's tragic death. Anderson's first book, The Life Writings of Mary Baker McQuesten: Victorian Matriarch was launched simultaneously with this website on Tuesday, May 18th, 2004. For more information on these books including purchasing information, please click here. In addition, Dr. Anderson has written and directed two plays based on the lives of the McQuestens. The first, A Rose E'er Blooming focuses on Mary Baker McQuesten and her strict Presbyterian views on religious and social matters. The second play, Ruby & Tom McQuesten: Tragedy & Triumph, relates the intertwined stories of the two siblings, first as Ruby sacrificed her health and meager earnings as a teacher to pay for Tom's education, which allowed him to become a successful lawyer and later, an outstanding politician. Both dramas were performed at the MacNab Street Presbyterian Church and included live music. A new McQuesten drama with Boris Brott music was performed at the Royal Botanical Gardens on August 14, 2011. Please click on Family to learn more about the McQuesten family. Thesis includes biographical and theoretical essays based on the PhD thesis, The Lifewritings of Mary Baker McQuesten (1849-1934): Victorian Matriarch of Whitehern, which are also searchable in Search, along with an extensible database of writings, speeches, newspaper articles, and other cultural artefacts from the McQuesten family Family, Timeline will give you a chance to learn more about the family, while Photographs and Whitehern will give you a visual look at Victorian life in Canada.